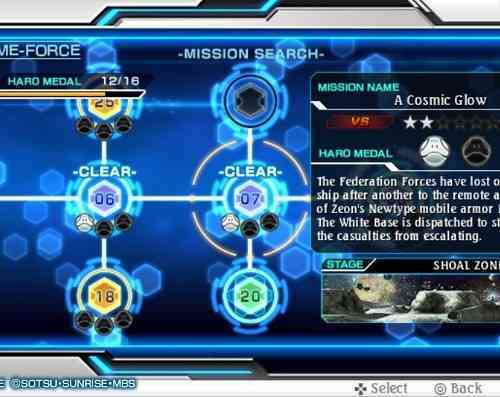 Just on the PlayStation Vita alone, there have been over 10 games in the Gundam franchise released on it. 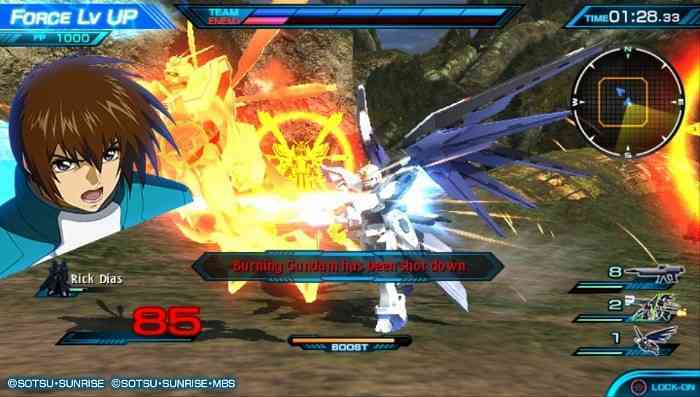 Most of these games, like Gundam Braker and Kidō Senshi Gundam SEED Battle Destiny, never made it stateside despite the series having a sizable North American audience. 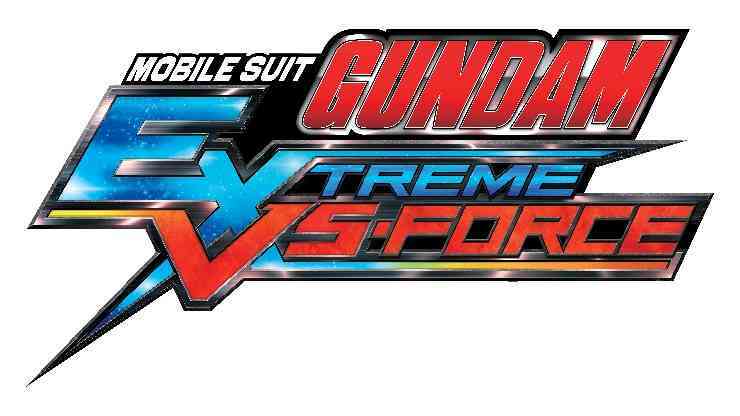 Luckily for those fans, publisher Bandai Namco has finally thrown them a bone in the form of Mobile Suit Gundam: Extreme VS-Force, an action game for the PlayStation Vita. 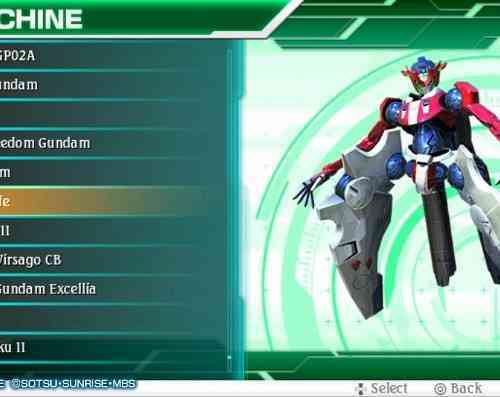 As a crossover game, Extreme VS-Force features characters from several of Gundam’s many sub-series. Mechas from Mobile Suit Gundam Unicorn are pilotable, and of course from the original series, which is what most North American gamers will be knowledgeable about. This makes the game a nice celebration for those familiar with the franchise, but the lack of focusing on a single Gundam series makes it pretty confusing for casual viewers. This is further complicated by the game’s premise focusing on recreated battles, so there’s no overarching story explaining what exactly is happening. It’s fine if you want a mishmash of different mechas battling it out in locations from the anime, but anyone looking to freshen up on lore will be disappointed. 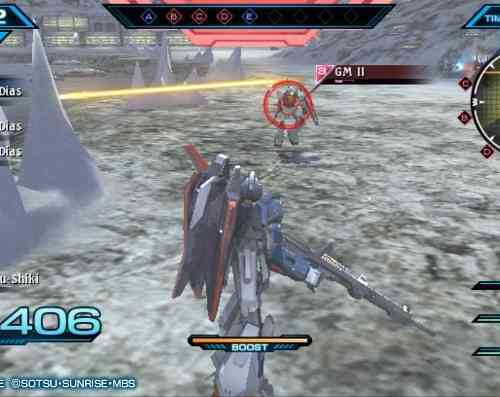 The core gameplay is pretty simple, as each Gundam has two different attacks which are typically a ranged & melee abilities. Several special attacks were also at my disposal, as I could hold down the right trigger to modify my regular abilities into rechargeable powerful moves. That’s really all there is to the core combat, which isn’t very complicated but generally enjoyable. 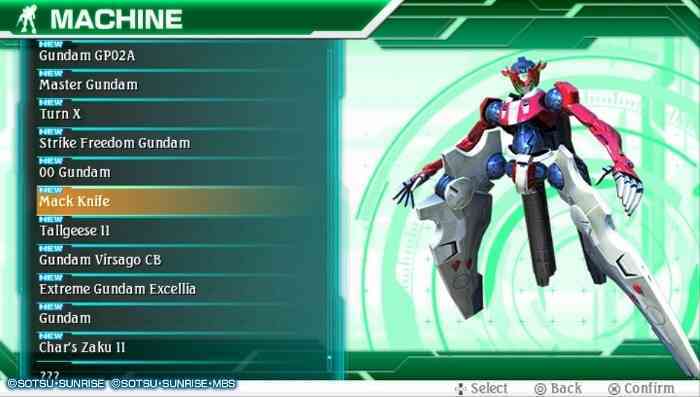 If there is one core issue with Gundam: Extreme VS-Force its that it feels like it should be on a console. While the gameplay is easy to learn, actually inputting it is a regular hassle. The control scheme is needlessly complicated for a handheld game, as it forces the player to remember more button combinations than the Vita had buttons. For example, to simply guard I had to hold the right trigger and then press the cross button. That could easily be the R1 button on the DualShock 4, and it feels like the game is actively hurt by being played on the Vita. In a smart design choice, most of the levels only last a few minutes. It’s really the only aspect of the game that is designed around being on a portable. There are often secondary goals that task the player with beating a level quickly (or without taking damage), so it’s meant to be providing short bursts of action that can be replayed. It’s a really genius way to handle things since long drawn-out battles wouldn’t be a good fit a commute. Missions are broken into two different types: VS and Force. VS missions are straight forward levels where the player just has to wipe out enemies. 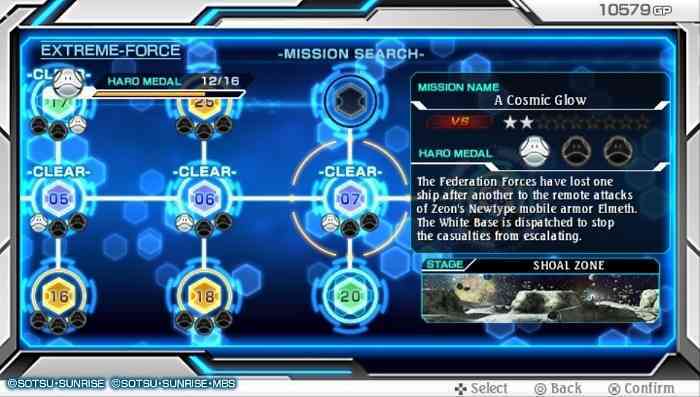 Force missions add a layer of strategy to the gameplay, as the player is actually commanding troops around and taking over bases. It won’t get confused for X-COM, but this light strategy adds a lot to what is otherwise a repetitive action game. Thankfully the game focuses more on the Force missions, which is good as it’s by far the more interesting of the two types. 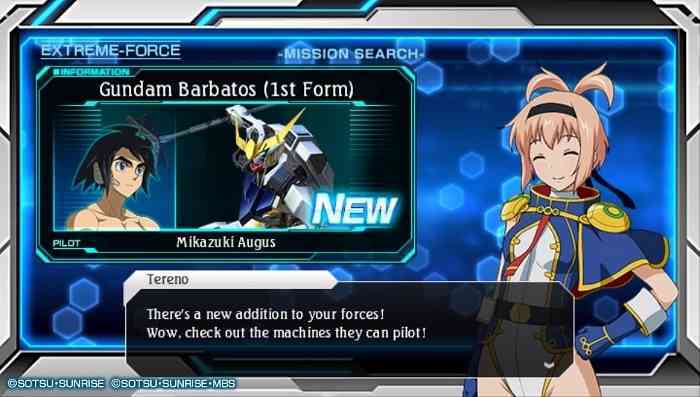 Regardless of the mission type, the player will be facing off against several enemy mechas at once and that’s one of the constant design flaws that hold the game back. The only way to aim is to press the circle button and lock-on to an enemy, which would be fine if it wasn’t needlessly finicky about who it selected. 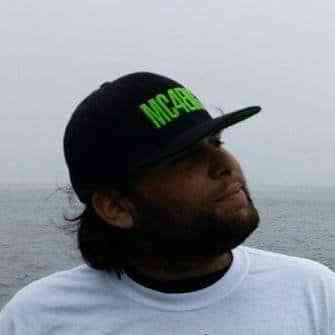 Often times I would be looking exactly at whom I wanted to target and the game would instead target someone behind me. I guess it was because they were technically closer to my Gundam, but it just leads to frustration. This really hurts in missions that require a certain enemy to be defeated and it simply became difficult to target these specific foes let alone damage them. 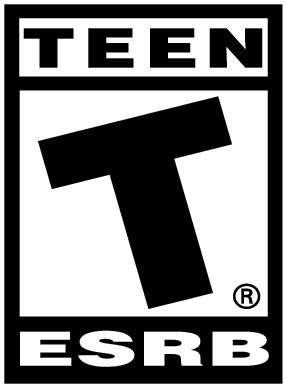 Other than the main mode, there’s two additional gameplay modes for players to check out. One is basically a free battle mode where the player can set up any VS fight they want. The other is a local multiplayer mode that allows players to bring their single-player characters into battle against each other. 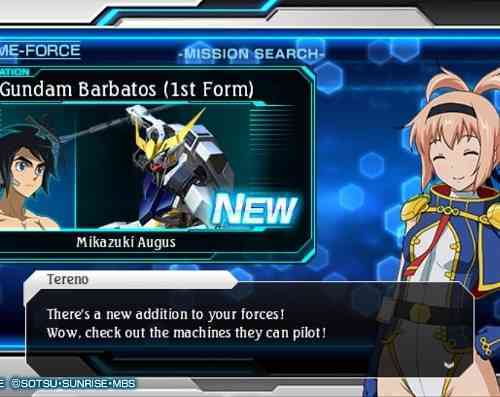 Rounding out the package is a database that offers up bios of each Gundam pilot seen in the game, which is a nice touch for a game that lacks a lot of the heart and story that drives the anime. 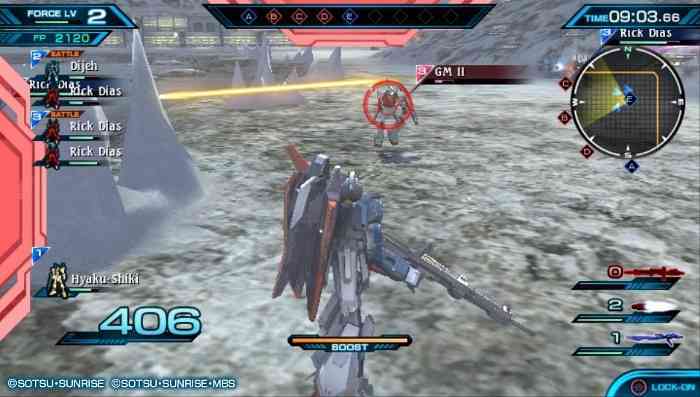 Mobile Suit Gundam: Extreme VS-Force has a lot for long-time Gundam fans to enjoy, but little to offer for newcomers. The action is too cumbersome for those just looking for a fun beat ’em up, but the amount of fan-service included is enough to make this a good time for those who enjoy the anime. Hopefully this will lead to some of the better Gundam games coming stateside, but as of now this is what fans will have to settle for.